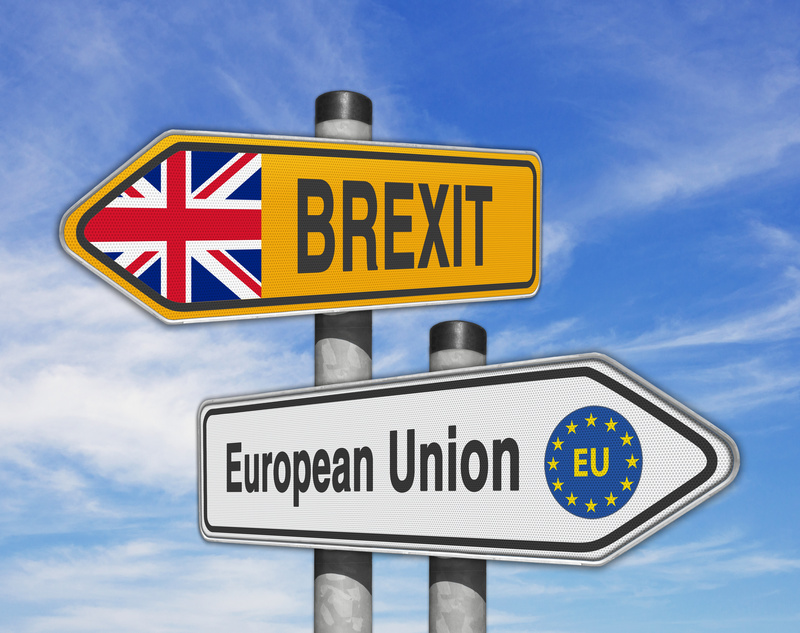 Observers outside the U.K. have probably viewed the Brexit process with a generally sanguine approach, assuming that the mother of all parliaments would come — in that most British of traditions — to some kind of pragmatic solution to the wide disparity of views and positions following the 2016 referendum in which the country voted to leave the E.U. The British people likewise assumed their politicians were capable of negotiation and compromise to reach a, if not optimal, at least a “least bad” outcome, to muddle through in the British way. But just about everybody has lost patience with the process and, in particular, the incompetence of Britain’s Prime Minister Theresa May, who keeps coming back to Parliament with the same plan only to have it resoundingly thrown out — not just by the opposition, but by many of her own MPs. Although the E.U. has agreed to a short extension to the March 29 departure, date it is dependent upon Parliament accepting May’s current and twice voted-down plan. 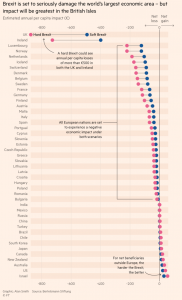 Whether that happens remains to be seen, but an interesting article by Tobias Buck in the Financial Times illustrates graphically why reaching a compromise solution is so important. Hard Brexiters — that is, those who would like to see the U.K. leave the E.U. with no agreement — would call articles like that in the Financial Times to be part of “project fear” (fake news, if you like) intended to blow out of proportion the consequences of a hard Brexit, to scare Remainers and those in the middle ground against a hard, no-deal Brexit. Hard Brexiters, as they are termed, see no adverse consequences to crashing out of the E.U. without a deal or that any such consequences are a price well-worth paying for Britain’s independence from Europe. But while the voters and businesses are sometimes influenced by their hearts, history shows they are better advised sticking to the facts and making decisions with their minds. Few sane economists or business people are suggesting there will not be consequences, however much one party or another disagrees with a particular analysis or report. 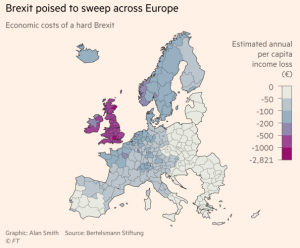 The Financial Times article quotes Germany’s Bertelsmann Foundation, which issued a report last week that estimates that the U.K. alone will suffer income losses of €57 billion ($64 billion) a year if it leaves the E.U. without a deal. The rest of the EU will lose €22 billion ($25 billion), almost half of which will fall on Germany, which is Europe’s largest economy and a big exporter to the U.K., the Financial Times states. On a per-capita basis, however, Britain and Ireland will probably be the biggest losers by far. U.K. income is expected to fall by €873 ($987) per head, while the equivalent figure for Ireland is €726 ($821). The French are estimated to be worse off, to the tune of €120 ($136) per head, and the Germans by €115 ($130). Displayed on a map, the impact can be seen to correspond very closely to geographical proximity. Those states, even regions within states, closest to each other are likely to suffer the most. Likewise, industries with extensively integrated supply chains across U.K.-E.U. borders surprisingly will not feel a greater impact than those which rely on local supply chains. As such, automotive, aerospace, pharmaceuticals, consumer goods and agriculture, to name but a few, will be most impacted. Britain and, to a lesser extent, the E.U.’s lack of preparedness for a hard Brexit shows just how both sides were making the assumption that the other’s intractability was simply a negotiating tactic. The reality is that even a three-week extension may not be enough for the British Parliament to agree to May’s plan and a hard Brexit with no formal agreement in place is for the first time becoming a real possibility.